Located in Beijing, 4 km from Beijing National Stadium - Bird Nest, 7Days Inn Beijing Madian Bridge North has rooms with free WiFi access. 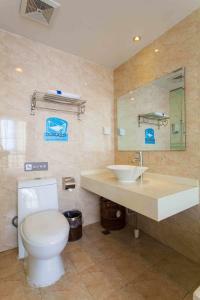 The property is set 5 km from Houhai Bar Street, 5 km from Shichahai Area and 6 km from Yonghegong Temple. Nan Luo Gu Xiang is 6 km from the property. At the hotel, each room is equipped with a desk and a TV. The private bathroom is fitted with a shower. Forbidden City is 9 km from 7Days Inn Beijing Madian North, while Tiananmen Square is 9 km from the property. Beijing Capital International Airport is 27 km away. Please note that guests are only allowed to book less than 3 rooms (maximum 3 rooms in total) a day. Please inform 7Days Inn Beijing Madian Bridge North in advance of your expected arrival time. You can use the Special Requests box when booking, or contact the property directly with the contact details provided in your confirmation. This property reserves the right to release the room after 19:00 on the day of check-in. Guests who plan to arrive after this time should contact the property directly. The contact information can be found on the confirmation letter.